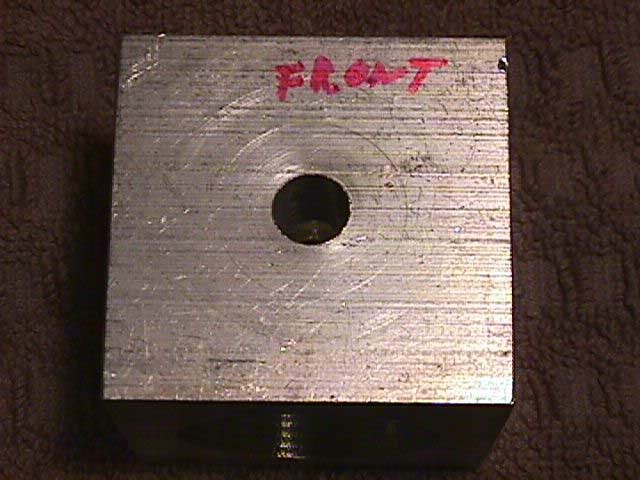 Project: A machinist's puzzle—CNC nested cubes by Tom Hubin - Millhill Supplies Ltd. This is a project done on my Sherline 5410 mill using TurboCnc 3.1a. 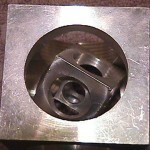 The photos below show various stages of the machining of the puzzle. It is simply a number of accurate boring jobs in a row. Start with a 2 inch cube of 6061 aluminum. 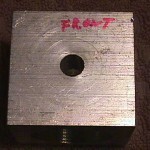 This can be a 2 inch length cut from 2 inch square bar stock. 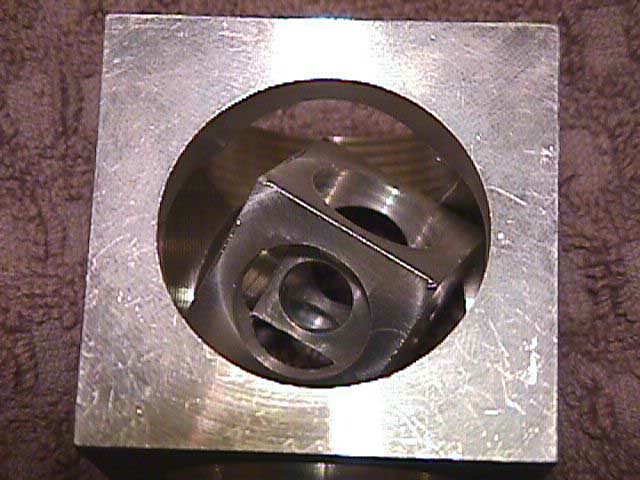 Mill or fly cut the outermost 1.950 inch cube from the 2 inch stock. 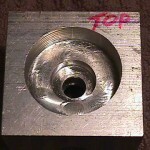 Be sure to machine something from all six sides so that the finish is attractive. Label the six sides as top, bottom, right, left, front, rear. Drill 3/8 inch diameter center holes into top, front, and right surfaces to a depth of 1.5 inches. These three holes will pass completely through the innermost cube. I used the 3/8 inch end mill holder with a machine screw length 3/8 inch diameter drill bit. Drill 3/8 inch diameter center holes into bottom, rear, and left surfaces to a depth of 0.75 inches. These three holes will not touch the inside of innermost cube. That way the 3/8 inch diameter center holes through the innermost cube will be seamless. 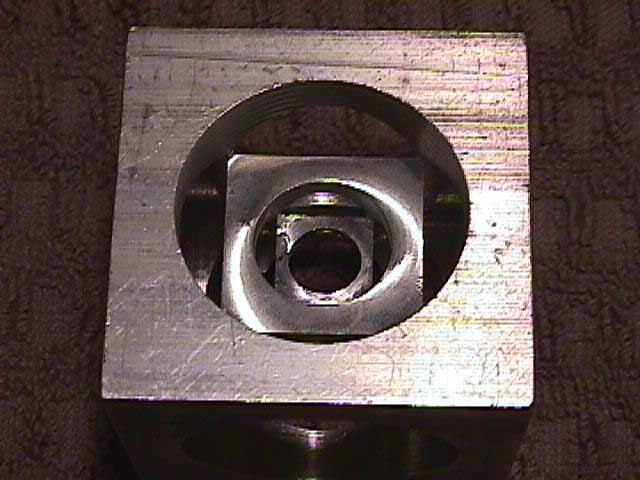 Secure the 1.950 inch cube in a vise and use an edge finder to accurately locate the rightmost surface and the rearmost surface so that the center of the topmost surface is at (X,Y)=(0,0). 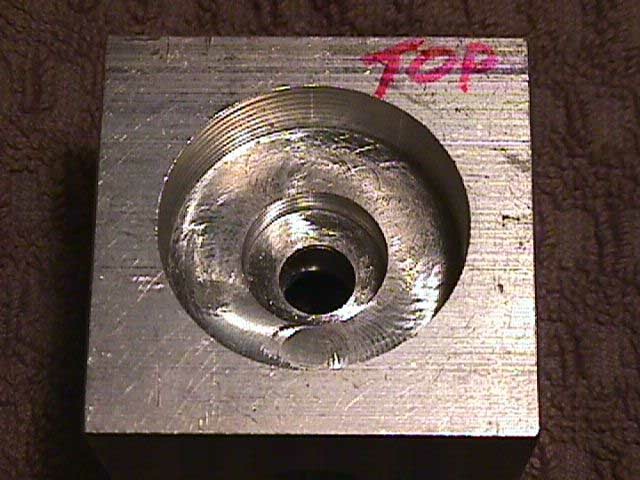 Load a 3/8 inch diameter x 5/8 inch LOC aluminum roughing end mill. Move it over the topmost surface. Lower the bit until it just touches the topmost surface. I usually do this by loosening the bit so that it drops down and touches the topmost surface. Then tighten the bit just enough so that it won’t fall out. Run the program. You will be prompted to touch the surface with the end mill. You have already done this so continue. The bit will be raised and you will be prompted to tighten the bit and start the spindle at 2800 RPM, which is max spindle speed on a Sherline mill. Tighten the bit securely then start the spindle. Stay near the machine, lubricating and clearing chips as machining takes place. Here are the CNC files in various formats. Right click on a file to save it to your computer or open it with the appropriate program. The remaining 3cubes. * files are binary files generated by the Borland C++ compiler but are not needed. *.txt, *.cnc, and *.cpp are plain text files and can be read and modified with just about any DOS, Linux, or Windows text editor. DOS Edit command can be used. I use the shareware DOS text editor PcWrite. Microsoft Notepad, WordPad and Word are Windows text editors that can be used. http://www.dakeng.com/gallery.html—Dan Statman’s dime sized nested cubes. Small and very very classy. http://www.grapevineglassworks.com/landscapes/cube.html—Artwork showing nested cubes with no hole through the center. http://www.geocities.com/barxe/cubering.swf—Animation showing something similar but here just for fun. 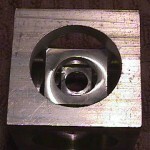 http://www.token.crwoodturner.com/magiccube/—Shows inner cubes detached so as to tumble freely within outer cubes.